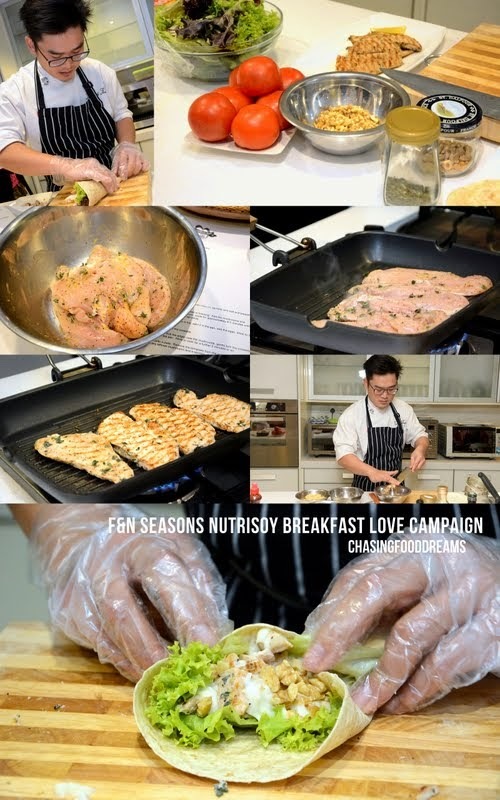 CHASING FOOD DREAMS: F&N Seasons NutriSoy Breakfast Love Campaign: Start Your Day with Soy Goodness! 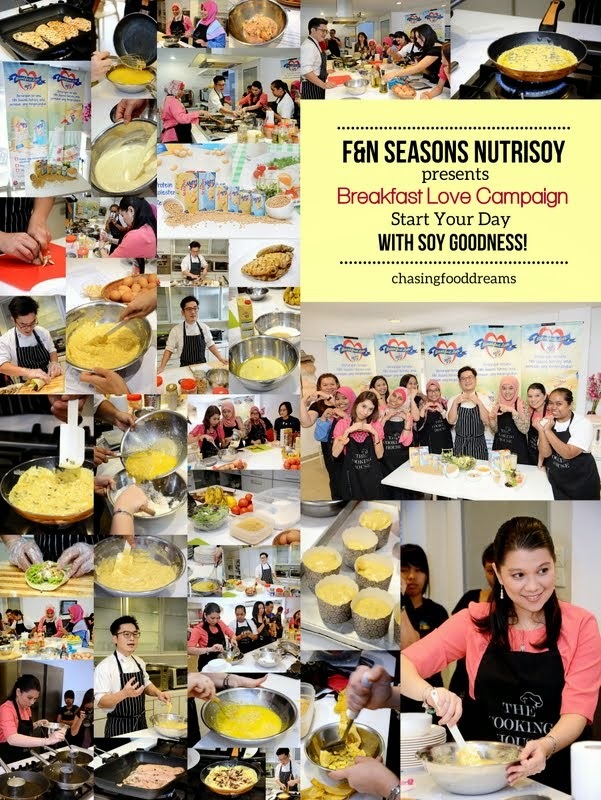 F&N Seasons NutriSoy Breakfast Love Campaign: Start Your Day with Soy Goodness! Eat Breakfast like a King, Lunch like a Prince and Dinner like a Pauper! We all have heard the saying many times and yet how many of us actually eat breakfast today? Nutritional experts believe that breakfast is the most important meal of the day. Studies have shown that those who do not eat breakfast are likely to have issues with health and weight gain. It is also important for those who do eat breakfast to make sure it is a healthy one! 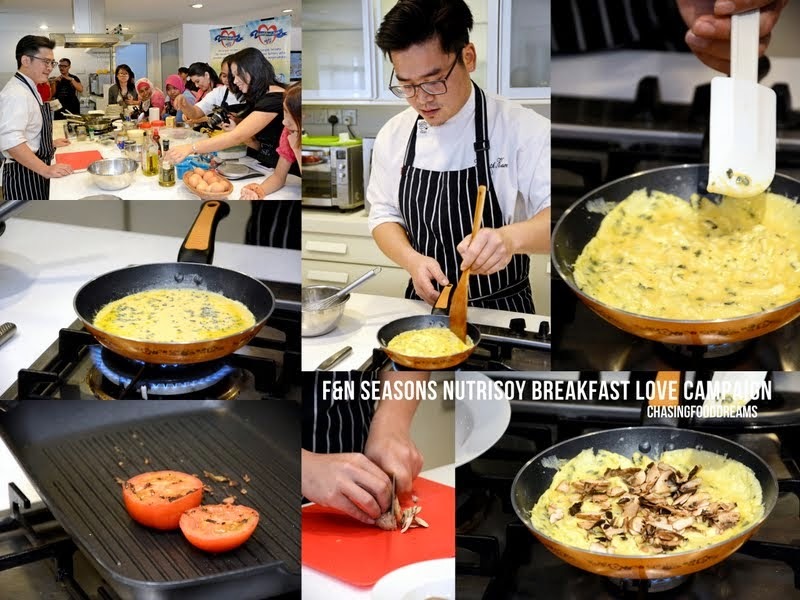 A recent invite by F&N Seasons NutriSoy in conjunction with their Breakfast Love Campaign had me spending a lovely Sunday at The Cooking House for a cooking demo on how to make healthy and nutritious breakfast with F&N Seasons NutriSoy soy milk. Being a mom is no easy task as we all thrive to juggle our family and work. Sometimes I admit to paying less attention to what I serve my little one due to all the activities in my life. So I was really excited about this cooking demo initiated by F&N Seasons NutriSoy to learn how I can make a healthy and nutritious breakfast for my family through their Breakfast Love campaign. 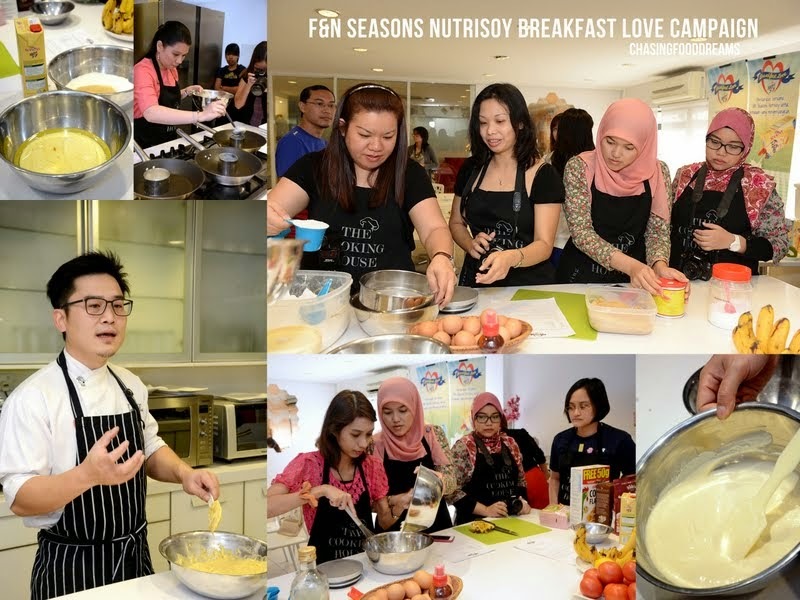 The campaign’s main focus is to have Malaysian mums like me show our love for our family by pairing a wholesome and healthy breakfast with F&N Seasons NutriSoy beverage. We arrived early and had our healthy breakfast with F&N Seasons NutriSoy. As soon as everyone settled in, the event took off with a light speech by Selena Tan, F&N Seasons NutriSoy Brand Manager. She proceeded to give us all an insight about the benefits of F&N Seasons NutriSoy soy milk before our cooking demo started. Made from soy beans, soy milk is a great source of protein and is made easily available nowadays. F&N Seasons NutriSoy makes an excellent and delicious soy milk perfect for daily consumption and is also readily available in the market. Packed hygienically, F&N Seasons NutriSoy provides a great source of protein without any added preservatives, flavouring and coloring. It is perfect for those who are lactose intolerant and is also low fat compared to other dairy beverages. In fact, the soy protein helps to reduce cholesterol. I am also pleased that F&N Seasons NutriSoy has two versions of soya bean milk – original and less sugar. If taking soy milk has lots of benefits for us, I would happily do so since soy milk is really a delicious beverage to enjoy. Even my little one enjoys this beverage quite often in my home and outside. After our little educational speech, our cooking demo took off, led by Chef Kenneth Kam. What I love immediately about this cooking event was that we all got our hands dirty and took on the actual preparation of four breakfast dishes. There were quite a few of us bloggers that day and I got to meet up with some familiar faces and some new ones. Right away, we all got comfortable with each other, rolled up our sleeves and set to work with the guidance from Chef Kenneth. We were divided up into groups as there were four breakfast recipes with some incorporating F&N Seasons NutriSoy soy milk into them. My group whipped up Homemade F&N Seasons NutriSoy Pancake with Banana and Toasted Almonds. Now before you say that you do not have time, rest assured that all four recipes are really fairly simple and easy to whip up. We measured all the dry ingredients and the wet ingredients separately. Combined them together till it reaches a smooth consistency and leave it to rest for a few hours preferably. Chef Kenneth also mentioned that the pancake batter can be prepared the night before to save time. Just leave it to rest in the fridge and it can be cooked on a hot pan right away the next morning. After the batter has rested, at least for 30 minutes, we proceed to ladle the batter into ring molds on a heat pan. Our pan cake fluffed up upon contact with the heat. Once cooked to a golden hue, serve our delicious pancakes with fresh cut bananas, toasted almonds, honey or maple syrup and chocolate chips. The recipe is really healthy as it uses F&N Seasons NutriSoy soy milk and grapeseed oil. 1. In a large bowl, sift together flour, sugar, baking powder, and salt. 2. In another bowl, whisk together grape seed oil, F&N Seasons NutriSoy and vanilla essence until mixture is relatively smooth. 3. Heat an ungreased, non-stick frying pan over medium-high heat. 4. Pour ⅓ cup of batter into the center of the pan. Cook until the edges start to look dry and visible air bubbles have just started to form near the center of the pancake. 5. Flip and cook the other side until golden. 6. Remove from frying pan and place on a serving plate. 7. Repeat until remaining batter is used up. 8. Serve hot, with sliced bananas, toasted almonds and maple syrup and F&N Seasons NutriSoy soy milk. The next group took on Homemade Banana and Walnut Muffins with Dark Chocolate. The recipe sounded really good and yummy. This recipe does not include soy milk in it but it is definitely yummy when served with a glass of F&N Seasons NutriSoy soy milk. The ladies had loads of fun taking turns to prepare the muffins. Everyone worked as a team and we all even had time to pose for photos. Steps were delegated and everyone had a task to perform, whether it was to measure the ingredients, cream the batter or mashed the banana. Again, we were told that this batter can be made the night before and all that is left was to bake the muffins the next morning for 25 minutes. Everyone came prepared with their cameras and phones to record all the step-by-step process… me included! 2. In a large bowl, combine flour, sugar, baking powder, baking soda and salt. Set aside. combined and batter is think and chunky. (The important thing is not to over mix the batter. 5. Spoon the batter into muffin moulds and sprinkle some chopped walnuts over. 6. Drizzle the melted chocolate over the top. 7. Bake in preheated oven for 25 minutes or until cooked. I am not a fan of banana but when these muffins came out from the oven, even I couldn’t resist taking one. The muffins are gorgeously fluffy and aromatic with a lovely sweetness from the ripe bananas. The bananas paired so well with the soy milk flavours. I am so going to make this recipe for my family! Our third recipe was a Mushroom Omelette with Oven Roasted Tomatoes. Chef Kenneth gave us lots of tips on how to make a great omelette and cook it like professionals. Our omelette was jazzed up with fresh herbs for more aromas. The sky’s the limit when it comes to making omelettes and we were told to get creative in our homes and use any ingredients we love in our omelettes. Again here, I do notice how well creamy eggs paired beautifully with sweet nutty soy milk. The mushrooms also lent an earthy note to the rich eggs while the roasted tomatoes are just fresh and juicy. 2. Place the tomatoes on a baking tray, lightly drizzle with olive oil, sprinkle with salt and pepper. Place in the oven to roast. 3. In a frying pan heat the oil and butter until the butter is foaming. Add the mushrooms and sprinkle with a touch of dried parsley, salt and pepper, sauté for approximately 4-5 minutes until the mushrooms are cooked. Remove from heat and set aside. 4. In another pan, heat butter. When the butter is hot, swirl it in the pan, add the eggs, allow to cook for about 2 minutes. 5. Place the mushrooms in the middle of the omelette. 6. Allow to cook for a few minutes. Roll the edges over the mushrooms; gently turn the omelette over so the seam is face down in the pan. Allow to cook for a further 2 minutes or so. 7. Gently ease the omelette onto a plate. Remove the tomatoes from the oven, scatter over the top of the omelette along with any leftover mushrooms and a sprinkle of salt and pepper. By now, we all were having a blast! Everyone took turns to pose for photos, ask questions and help out with everything. The morning flew by and we all got to savor our fruits of labor as soon as each recipe was completed. Our last recipe was a Wholemeal Breakfast Wrap with Mixed Greens and Grilled Chicken. Though we got a recipe for marinating the chicken, we went beyond it and added fresh herbs and lemon zest. As soon as the chicken hit the grill, everyone and I mean everyone was saying how good the chicken looks and how awesome the aroma was in that room. As soon as the chicken was cooked and cooled, Chef Kenneth assembled the wrap with the dressing. Again here, there are no rules and we were all encouraged to add in whatever takes our fancy. The wrap is perfect as packed lunches as it won’t go soggy and taste fresh and flavorful. Using whole meal tortillas also helped to make this healthy and nutritious. 1. Marinate chicken breast with salt, pepper and Lea & Perrins sauce. 2. Place chicken on a grill pan and grill until both sides are just cooked through, around 6 – 8 minutes on each side. Let rest and cut into strips. 3. For the salad dressing, mix together all the ingredients in a bowl and whisk until emulsify. 4. Lay a piece of tortilla on a clean plate, spread 1 tablespoon of the salad dressing on the lower third of the tortilla. Lay ¼ of the chicken breast slices over, followed by some mixed leaves salad. Drizzle some more honey mustard dressing over and roll up. Continue with the remaining tortillas. Serve immediately. At the end of the demo, the F&N Seasons NutriSoy team showed us the easier and simplest way to a healthy and nutritious breakfast made for those who have time constraint. Simply pour F&N Seasons NutriSoy soy milk over our favorite cereals and breakfast is served! It was truly a very memorable and enjoyable event. Besides learning about the benefits of a healthy and nutritious breakfast with soy milk, we also got to learn several recipes and meet new friends. I also learned that F&N Seasons NutriSoy is so versatile that I can enjoy the soy milk beverage as it is or incorporate it in recipes. Thank you to F&N Seasons NutriSoy for initiating the Breakfast Love Campaign and for organizing this event. It is important that we are always reminded on leading a healthy life with our families and keeping our tummies filled with nutritious food. 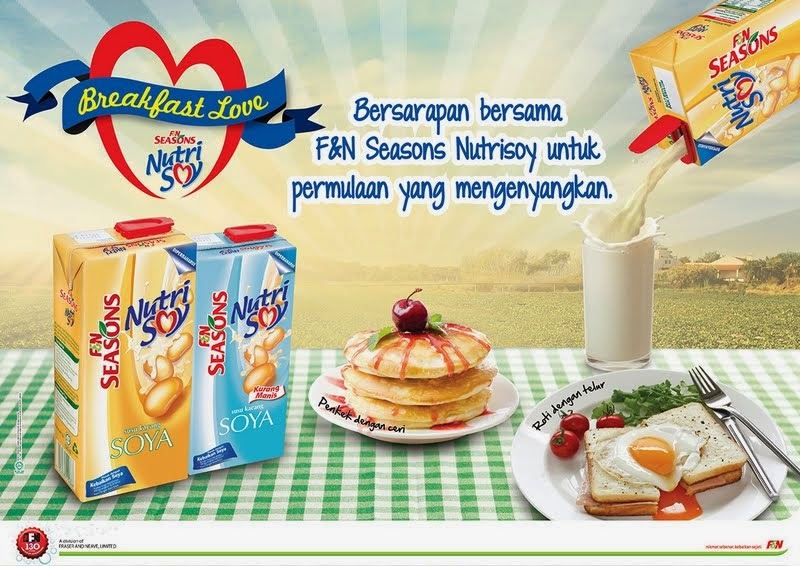 Stay tune for my own healthy breakfast recipe with F&N Seasons NutriSoy! Gotta give those pancakes a try! Look so good!! !